It is a warm summer evening in the south of Italy and the garden beckons for company. The extended sunshine hours have cultivated the blooming of wisteria, star jasmine, and roses climbing along the trellises and arbors. 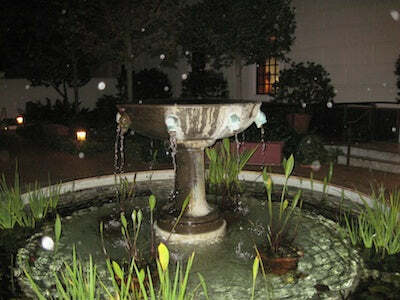 The courtyard focuses on a babbling fountain designed in exquisitely crafted, boldly colored tile and a seating area surfaced in clay pavers where friends and family congregate over a bottle of wine and plate of cheese and fruit. Dating as far back as ancient Greece and Rome, these garden/courtyard areas were common amongst both the wealthy palaces as well as the smaller village homes. They were open to the sky and fresh air, adorned with luscious plant-life, sculpture, decorative masonry, and a fountain or pool. The gardens of the Mediterranean are idyllic and have inspired landscapes throughout various regions and throughout the centuries. These heavenly spaces were intended to be utilized, to be lived in; they were a common gathering area and therefore were designed with both function and aesthetics in mind. Seating was intimate with both companions and attractive vegetation. Fountains were placed on rock walls as well as created as centerpieces. Texture and color are important elements, as well as the notion of secluding oneself from the rest of the world. Paving for seating areas and walkways could vary from gravel, stone, and concrete, providing it offered practicality, as well as splashes of color and variance in texture. Emphasis was given to the pools and fountains and there was great variety in these designs. Even the smallest garden could utilize a free-standing basin of elaborate or simple detail. Old monasteries may be adorned with an antiqued cistern head or simple geometric shape. Stucco was a common material, although concrete could also be used. 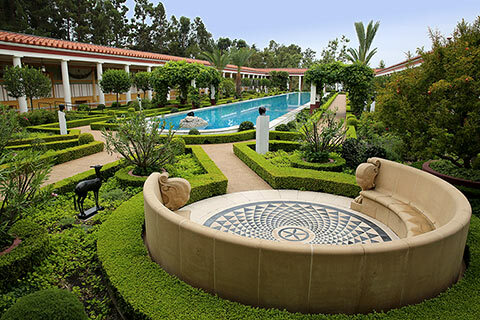 The Getty Villa of Los Angeles has been reconstructed after an ancient Roman style villa. 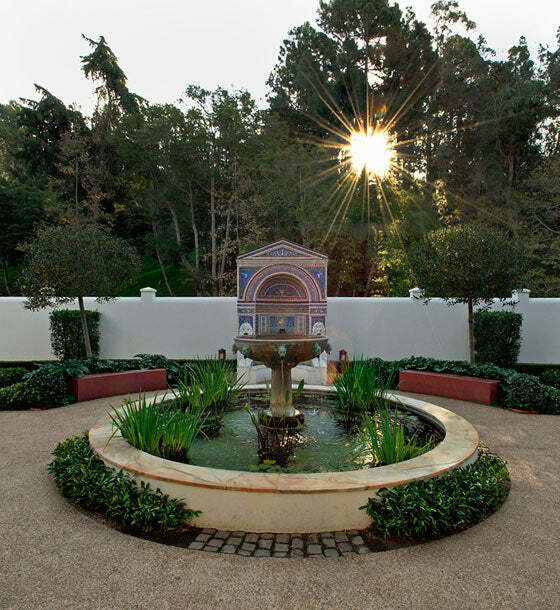 Their east garden offers an exquisite example of a fountain focal point, adorned with indigenous plant life and secluded from other sections of the property. There was no limit to the imagination for fountain designs, motifs, and materials used. One could utilize a wall structure with bold tile colors and statuary. 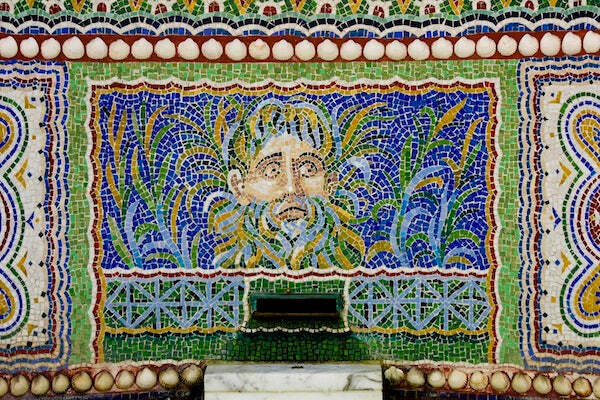 A mosaic could be created using smaller, brightly colored stones, tiles, and gravel. The more elaborately-inclined could create pools large enough to wade in, should one desire on a hot summer's day. 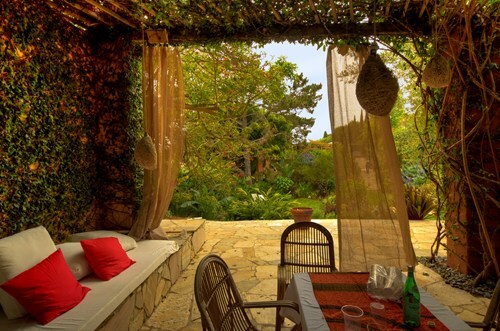 Let your creativity soar when designing your dreamy and inviting outdoor spaces. Avente Tile has a plethora of options in colors and textures to manifest your design idea! If you, like millions of others, watched the Brazil vs. Croatia soccer match that marked the start of the World Cup on June 12, then you saw the Arena Corinthians stadium in Brazil where the game was played. Our friends at Tile of Spain were kind enough to share some amazing tile facts about the Spanish tiles that were used for this project. The stadium's façade is covered with approximately 12,000 square meters of tile, which is equivalent to 2.97 acres or 129,000 sq. ft. of tile! 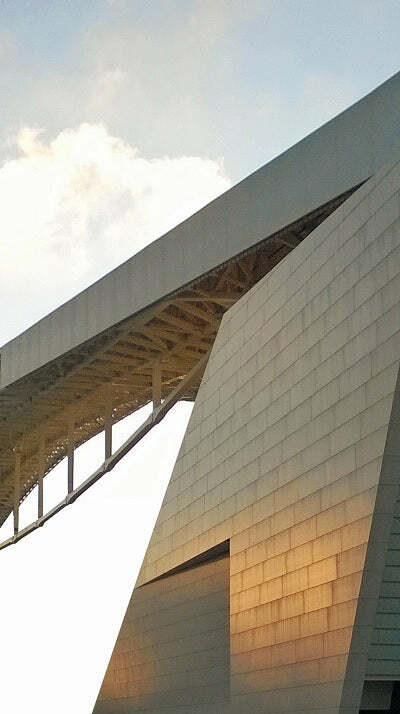 The tiles are TECHLAM® NEU porcelain panels developed and manufactured by Spanish company Levantina, and cover the outside of the Arena Corinthians Stadium. The 12,000 square meters were cut into 4,000 1x3-meter panels, which are 5-mm thick and weigh 11.87 kg per square meter. The material, manufactured entirely in Novelda, Alicante, required more than 500 hours of work to create. The panels were then shipped to Brazil in 10 containers. Further, Tile of Spain mentions that this "cutting-edge porcelain material is highly resistant to adverse weather conditions, sudden changes in temperature and severe climatic conditions. This guarantees a very long life-cycle; when properly fitted it can last a lifetime." As a Greenguard certified product, TECHLAM® ceramic tiles are suitable for environmentally friendly uses. 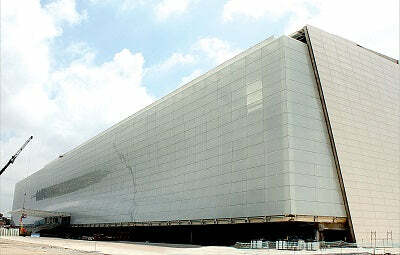 "The Arena Corinthians Stadium has been built to sustainable design standards. Architectural solutions for energy efficiency, the use of alternative energies, improvement of interior environmental quality and efficient water consumption have been implemented in this project," noted Tile of Spain. Further, as a 100% natural product, TECHLAM® is produced using oil-free mineral raw materials. Also, because of its thickness, it takes less energy to produce and ship than conventional tiles. Maintenance is also environmentally friendly as only water is needed for cleaning. The Arena Corinthians stadium is one of the latest international projects in which TECHLAM®'s versatility has been utilized. Additional projects can be found worldwide, including: Hotel Hilton Times Square in NYC; Seocho and Hyehwa metro stations in South Korea; Australia's Rendezvous Hotel Perth; Germany's Frankfurt Airport; metro stations in Prague; and more. More information about TECHLAM® by Levantina can be found here. Many thanks to the great folks at Tile of Spain for sharing this phenomenal structure and technology with us! As summer starts to kicks into full swing with the solstice less than 10 days away, I find myself enjoying the perfectly splendid outdoors of Southern California with longer walks each day. This summer, our blog is dedicated to handcrafted tiles and their use outdoors. Last week we introduced our new Artisan Porcelain Tiles for the Pool! 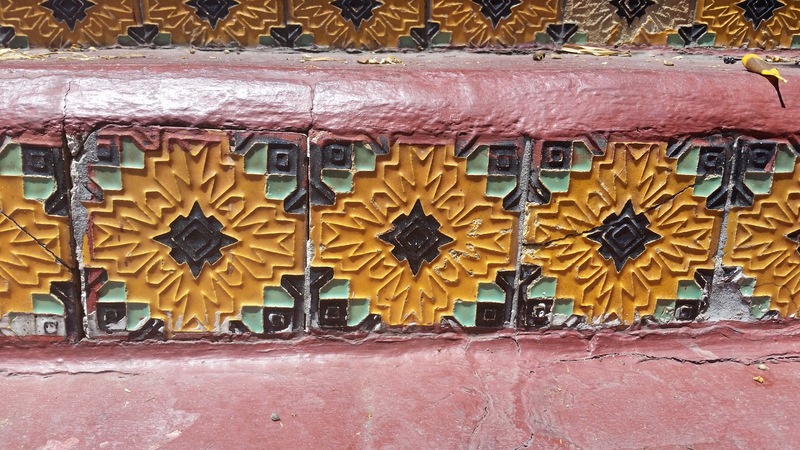 This week I share my favorite historical tile installations that I've discovered during my urban treks in the neighborhoods of Los Angeles and Beverly Hills. 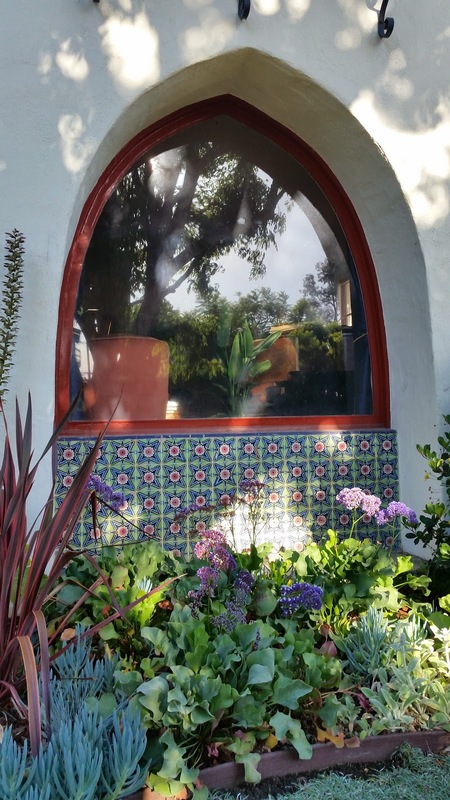 create a colorful tribute to Spanish Revival architecture. Most of these homes, duplexes or commercial spaces were built in the late 1920s. What you’ll see in every photo is the optimism that was prevalent in the era. Optimism expressed in the colors of the tile and the details of every structure; details that you rarely find today. Each installation pays homage to a specific architectural style: a portico found in a Mission style home, an extremely decorated façade of a Spanish Renaissance commercial location, or a fountain typical of Spanish Colonial architecture found in a duplex courtyard. You’ll find that these installations show some wear; but, they are a great tribute to both Los Angeles architecture and the classic forms they honor. Patterns grouped or "blocked together" create an impact on the entry to a California Courtyard. Color or pattern blocking is a common method where tiles of the same color or pattern are grouped together to create maximum impact or define an area. Unlike the photo above, here you see several different patterns and formats used on a planter box below a window. The quarter design circular patter has strong ties to Moorish patterns and the smaller format cross pattern is class Spanish. 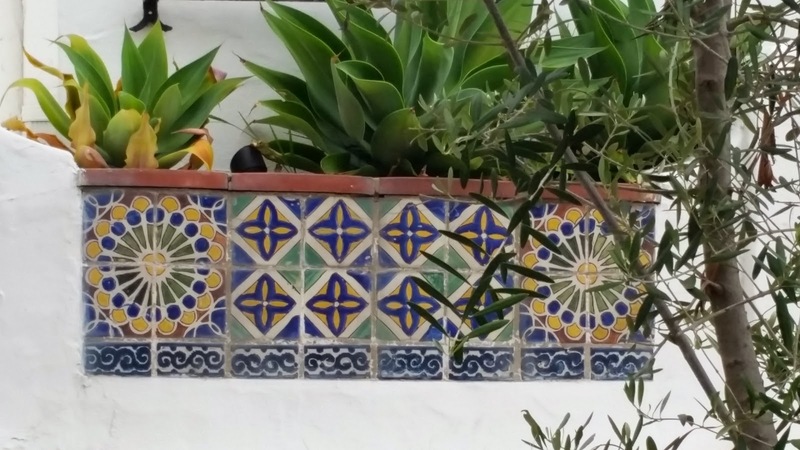 The colors are typical of tiles from the 1920s with a listello border on the bottom of the planter box. Tiles patterns on this planter box are Spanish and Moorish influenced. The cohesive palette and tiles is circa 1925. Something you don't see very often today is the use of brick with Spanish tile. We often think of brick as being traditionally English. 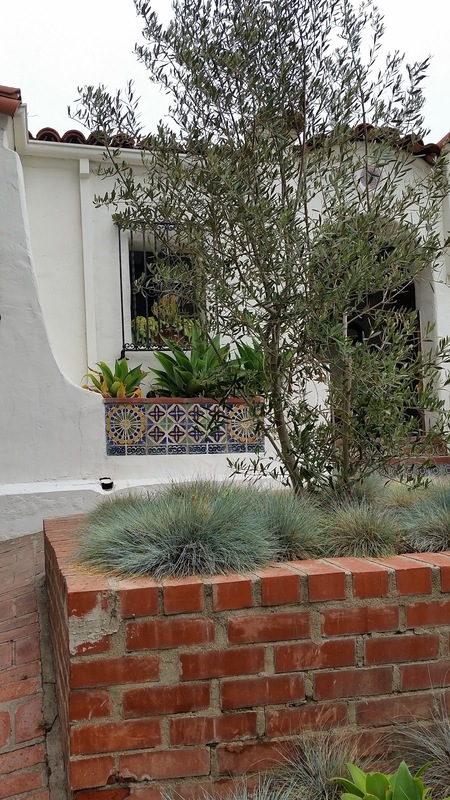 However, the red clay brick plays nicely with the red clay roof tile and decorative Spanish tiles on the planter box because it has a natural "terra cotta aesthetic." The architectural details on the home enforce the Spanish style theme. home's architectural theme is influenced by Spanish details. 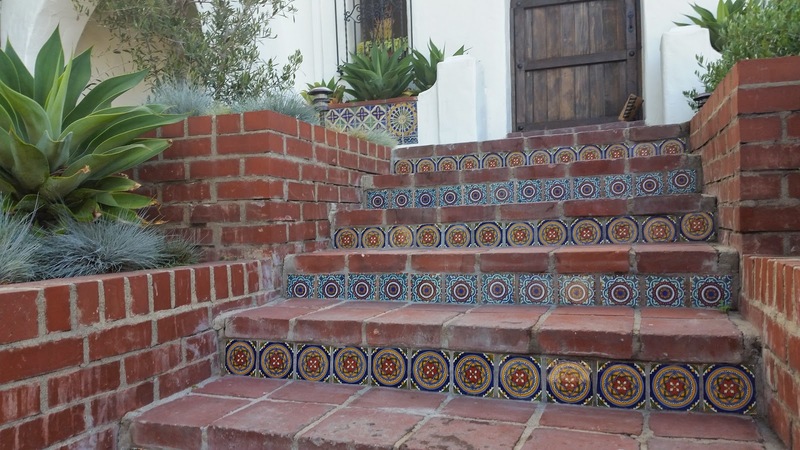 Spanish tiles are used for the stair risers on this brick path leading up to the home. Notice the planter box to the left of the door at the top of the stairs. A cohesive color scheme of different shades of blue on the tiles work well with the alternating stair rise patterns and the planter box. allows different patterns to harmoniously exist. Architecture often speaks to the times both in form and function. The period in the late 1920s in Los Angeles was one of optimism and hope. Sunflowers are often considered a symbol of optimism with their big, over-sized, bright yellow flowers reaching up to the blue sky in the warmth of summer. Nothing symbolizes this optimism more than these stylistic sunflower tiles used on this Beverly Hills duplex. Architecture captures the mood of the times. 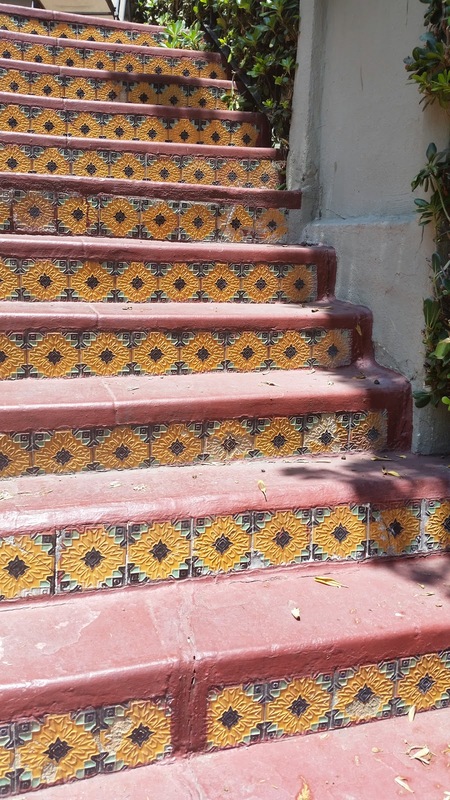 These stair risers are tiled with a sunflower motif (circa 1925). Doesn't that get your attention? You can't help but smile seeing those tiles on the stair risers. Here's a close-up of these stunning tiles! I hope you enjoyed exploring some of my favorite historical tile installations near the Los Angeles neighborhood where I reside. These are great examples of how Spanish tile have been used to complement an existing architectural style. Throughout the summer, we'll explore more homes in the neighborhood and share additional ways to bring tile outside! 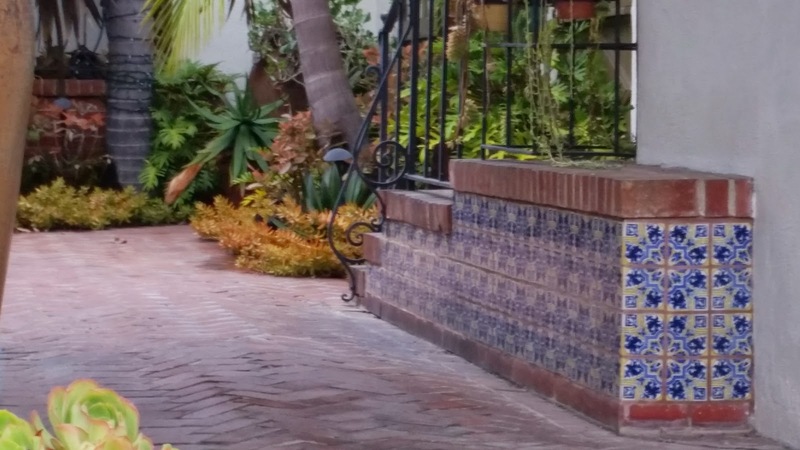 If you liked this post, don't miss my previous post, Spanish Tile Details Charm this Los Angeles Neighborhood.